SpaceX and Tesla founder Elon Musk has revealed the first design for the hyperloop, a high speed transit system that could take people between San Francisco and Los Angeles in 35 minutes. Aluminum pods enclosed in steel tubes would transport people at up to 800 miles per hour, according to a document published on the SpaceX website and first reported by Bloomberg Businessweek. Two tubes would run alongside each other and ferry people in opposite directions. At each end, they would connect in a loop. The tubes would be mounted on concrete pylons 150 feet to 300 feet apart. The pods would travel about 5 miles apart, which means 70 pods could be en route between San Francisco and Los Angeles. They could depart every 30 seconds. Additional tubes could branch off to allow stops at stations between the two cities. “Short of figuring out real teleportation, which would of course be awesome (someone please do this), the only option for super fast travel is to build a tube over or under the ground that contains a special environment,” Musk wrote in the design paper. Musk proposes two sizes for the tubes. The smaller version, which would have an interior diameter of 7 feet 4 inches, would be large enough to carry people. The larger design would have a diameter of 10 feet 10 inches. That would allow pods large enough to fit a car, which means passengers could drive right onto the hyperloop. 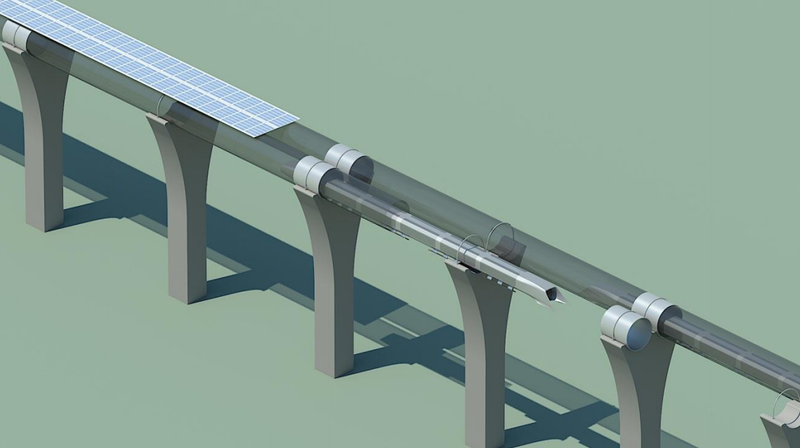 The hyperloop would be solar powered. Panels would be placed along the tubes sporadically, as otherwise they would produce much more energy than the hyperloop would need. They would power linear induction motors, which are designed to power objects traveling in a straight line. Each time a pod passes a motor, it would receive a boost, allowing it to gradually accelerate to and maintain a speed of 800 miles per hour. Energy is recaptured when the pod slows down. Air pressure inside the tube would be low. An electric compressor on the nose of each pod would transfer built-up air pressure from the front to the rear of the pod. This would make the pod experience very little friction and create a cushion of air that allows the pod to travel like a puck on an air hockey table. Musk expects the tube would cost several billion dollars, while the pods and motors would cost several hundred million. On a press call, he set the overall price at $6 billion or less. The light weight of the tubes and pods would mean the pylons would provide ample support for the hyperloop–a contrast to the expensive foundational work needed for the California high speed rail project. Musk said the pylons would have earthquake dampers to protect the structure from earthquakes, but, like a building, it would have its limits. “If LA falls down, I guess the hyperloop will too,” he said in the press call. He also clarified that the hyperloop would be extremely difficult to crash, but not impossible, as he had said in the past. Musk said that while he would love for someone else to work on developing the hyperloop, he is willing to build a prototype himself. If he started right now and made it his main priority, it would take two years. Tesla and SpaceX are his priorities, however, so it would more likely take three or four years. He guesses it would take an additional four or five years to build the line between San Francisco and Los Angeles, putting its opening date at an ambitious seven to 10 years from now. That would beat the completion date of the California high speed rail project. While Musk said the hyperloop could be prototyped on private land, such as SpaceX’s test facilities in Texas, the builder of the San Francisco to Los Angeles line would need to negotiate for land. Running it along Highway 5 would be ideal because it is mostly straight and built on government land. 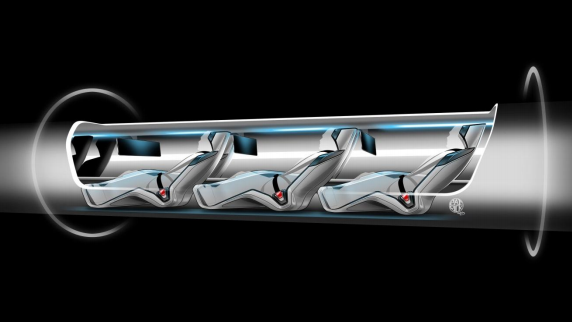 Musk first mentioned the hyperloop in July 2012. Before today, he had revealed that it would resemble a cross between a Concorde, railgun and air hockey table. He first started thinking about the project when he read about California’s high speed rail project, which disappointed him because of its slow speed. Musk tweeted this morning that he stayed up all of last night working on the design. While he started working on the hyperloop 1.5 to 2 years ago, he has since brought in help from more than a dozen people at Tesla and SpaceX. It was a background project until a few weeks ago, when some of them began working full time to complete the design. This post was updated several times Monday afternoon as more information become available. The Hyperloop is an exciting idea for fast distance travel, but similar to current public transportation options like California’s Silicon Valley light rail system or Caltrain commuter train system, it relies on the public to travel to and from a designated train stop. If one were to use our BiModal Glideway system youâ€™d be able to travel from door to door without relying on changing trains, busses or leaving your car in a crowded commuter parking lot during the day where it could be vandalized. Visit our website for a short video description and more information about the BiModal Glideway and leave us your comments or questions about our system. We can also be found on Facebook, Twitter and LinkedIn. I’m grateful that he covered the horizontal curvature (pages 43-50), but what about vertical changes. I guess that in general the tube can’t be perfectly straight, but at 400-800 MPH, you can’t just make a turn very easily. I’m sure that this will be worked out in the long-version plans. Elon Musk reminds me of the monorail salesman from The Simpsons. Let him build a proof of concept, then we’ll talk. Still, safety is going to be a major concern for this project. How will the emergency brake work if there is a problem? Getting into any accident at 800 miles per hour means you aren’t gonna be walking away unscathed from that, guaranteed. -The center of gravity needs to be able to adjust dynamically if the air-bearings are to be loaded equally (I’d assume that’s preferable). -Storing steam from the intercooler and then swapping said storage tank at a terminal…. I’m not to hot on that idea. That’s a point of failure right there. Other than that the whole thing seems very feasible. If Musk doesn’t plan on building this himself I’d like to see him open-source the engineering, thus allowing the world to contribute to and benefit from this technology at the same time. Analyzing individual components and complete sub-systems would make for some excellent and engaging homework for engineering students for the next decade or so. Wow! This is nuts. I love it. I wonder if there is a better place to build this, outside the U.S. first maybe, where public transportation is widely used and tax payers won’t freak out, i.e. France or Germany? Also, thinking about step functions and customer adoption, going from Amtrak to Hyperloop is quite a leap and hard to make, versus going from SNCF to Hyperloop, or bullet train in Japan to Hyperloop, not so big of a leap. Californians are being pushed to spend $100 BILLION on a “high speed” rail project, which is expected to take 20 years to complete, and will ultimately be able to get you from San Francisco to San Jose in about the same time it takes to drive today. After seeing this proposal by Elon Musk, it would make sense for voters here to cancel the rail project, build this instead, and reduce our overall cost to less than 10% of the current rail estimates.